Charles (Chas) Clements was a high end London Retailer of knives from approx. 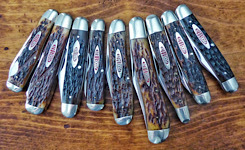 1890 to the 1970s (though Levines has it as 1850-1875 it was incorrectly noted)… from my understanding Clements knives were made in Sheffield and he sold a great variety. Perhaps familiar to many who collect military knives his WWI knuckle knives or trench knives were quite popular and those were made by Ibberson of Sheffield. Clements had multiple locations but the number was dramatically reduced by the 1920s. This particular knife was from the Billiter St shop as noted on the tang stamp of the pen blade which was an earlier location that started in 1908 but was no longer listed by WWI. This info was summarized from Ron Flook’s The London Knife Book (a good resource for London knives). Thus this knife is at the least 100 yrs old and probably just abit older. This small knife in my eyes shows some real cutlery craftsmanship in many different ways though the responsible Sheffield maker is not known (see tang stamps). This small type of knife with lots of character really trips my trigger ... While only 2 ¼” closed, it has 4 blades a (master, pen, scissor and a glove hook) - notably strong springs and very lightly used blades though some peppering from age with probably original finish, and even the scissors work like new . Tortoise shell handles are highlighted by gold foil placed between liners and handle covers (which was done on many tortoise handled knives and can be seen in photos). Also note how thin the tortoise shell covers are in the side view photos which I had read was the sign of skilled hafting (unfortunately there are just a few minor tight hairline cracks at at an outer pin. There are 3 back springs all with file work - the 2 outer springs were gold washed which is also seen inside the wells of the knife. The middle spring though polished had file work but no signs of gold wash on the back spring or within the handle wells – nice touch with some style. The 2 inside brass liners were milled as seen on the top down view of blades – the outer liners were not milled. I think the bail may be brass but with less copper in contrast to liners (liners are no doubt darker in color suggesting more copper if I’m not mistaken). No doubt a high end knife and as some suggested most likely made for the aristocrats in England. Though stamped “Sheffield Make” on back of Master blade (see stamp) the Sheffield maker is unknown. While this was was stamped “Sheffield Make” I have seen others stamped “Sheffield Made”. Nonetheless it was not unusual for retailers to contract the knives to cutleries which were stamped only by the retailer’s name. One interesting note on the Billiter St tang stamp on pen blade – underneath but hidden by liners is 2 other letters – almost looks like a “ES” – but no matter where the tang of the blade resides it is impossible to see clearly. Lee, that is a beautiful knife that took some special skills to build. I love the faceted hook and the swedge on the scissors. And more. Beautiful in every way. Congratulations on that one. Very nice Lee! It exudes quality cutlery craftsmanship in every regard Like the bail. I forgot to mention the bail! ............. I like the bail. .......... And the pictures. 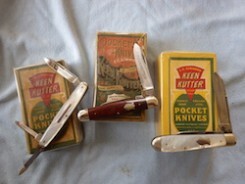 Thanks Lyle ... Great info from the link and the post from Wellington - indeed Mills sounds to have been the possible maker given the description of his knives!!! Very fine knives, Lyle. They are really a beautiful pattern. Good for you. Worried , because that Mick has not been heard from for a long time. LongBlade wrote: Charles (Chas) Clements was a high end London Retailer of knives from approx. 1890 to the 1970s (though Levines has it as 1850-1875 it was incorrectly noted)… from my understanding Clements knives were made in Sheffield and he sold a great variety. Perhaps familiar to many who collect military knives his WWI knuckle knives or trench knives were quite popular and those were made by Ibberson of Sheffield. Clements had multiple locations but the number was dramatically reduced by the 1920s. This particular knife was from the Billiter St shop as noted on the tang stamp of the pen blade which was an earlier location that started in 1908 but was no longer listed by WWI. This info was summarized from Ron Flook’s The London Knife Book (a good resource for London knives). Thus this knife is at the least 100 yrs old and probably just abit older. That's a beautiful multi-blade folder, Lee. Certainly a top quality knife and the tortoise shell handles and file work are stunning. Beautiful knives, Lee and Lyle!! Great informative post, Lee!